Whilst our conventional panel mounted products require relatively simple glass windows, our field mounted products have to withstand high impacts. As a result the windows are much thicker than normal and are mounted on the front of the instrument. Ceramic ink is reverse printed on the borders before toughening, which provides an ideal surface for bonding to the case recess. This bargraph indicator presented some significant design challenges in that multiple holes had to be drilled, and then coloured opaque areas were added to conceal the fixings underneath. Everything has to be manufactured to tight tolerances and maintain a perfect cosmetic appearance. Our panel instruments are normally housed in plastic enclosures, but our new range of rugged stainless steel products require an exceptionally strong window. Piper glass worked closely with our design team to develop a cost-effective yet reliable solution. BEKA associates produces a range of industrial process control instruments that are designed to operate in harsh environments worldwide. 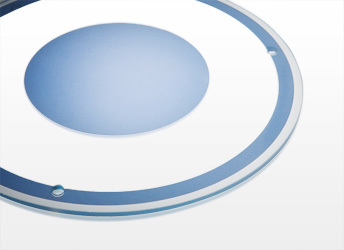 Piper glass produce the front face of every instrument to tight tolerances and a flawless cosmetic appearance. Our broad product range requires a finished material thickness of between 2mm to 10mm, some of which are drilled and screen printed before being toughened to a consistent standard. 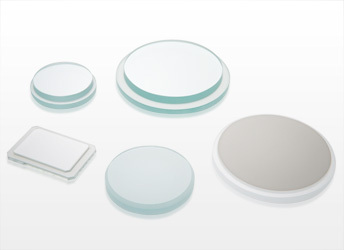 Our comprehensive range of small glass components include lenses for the lighting industry, gauge / pressure glasses and sight glasses. All components can be produced to the finest of tolerances with various edgework such as flat ground, bevelled, rebated and polished and are available in thicknesses from 2-25MM. Sandblasting is a technique used effectively to diffuse light or reduce glare and also looks attractive on decorative glass. We currently stock 4mm / 6mm / 10mm in sheet form or alternatively we can sandblast clear glass using our in-house facilities. Piper Glass has worked with us for over 30 years, Â supplying the windows on our range of industrial process control instruments. They have helped us through the design phase of every product, and as experts in their field have been able to advise us on the best approach to each design problem. They have then gone on to manufacture production quantities of components to exacting tolerances with a flawless finish, yet maintain competitive prices. If only all our suppliers were this good!